Hold on to your hats, folks! HEXUS, in partnership with Zotac, is giving one lucky reader the chance to win an epic GeForce GTX Titan graphics card worth over £800! This is a graphics card that needs no introduction anywhere in the gaming world. But hey, a refresher can't do any harm. We're talking 7.1 billion transistors, 2,688 processors, 224 texture units, 48 raster operators, 6,144MB of memory... all culminating in 4,494 gigaflops of graphics power! Put simply, graphics cards don't come much better than the GeForce GTX Titan and we're giving you the chance to win one for free. It's a competition not to be missed, so answer the simple question below to be entered into our prize draw - and don't forget, you can increase your chances of winning with a free second entry via Facebook. The competition winners will be picked at random from all eligible entries that arrive by midnight of the closing date, September 6, 2013. 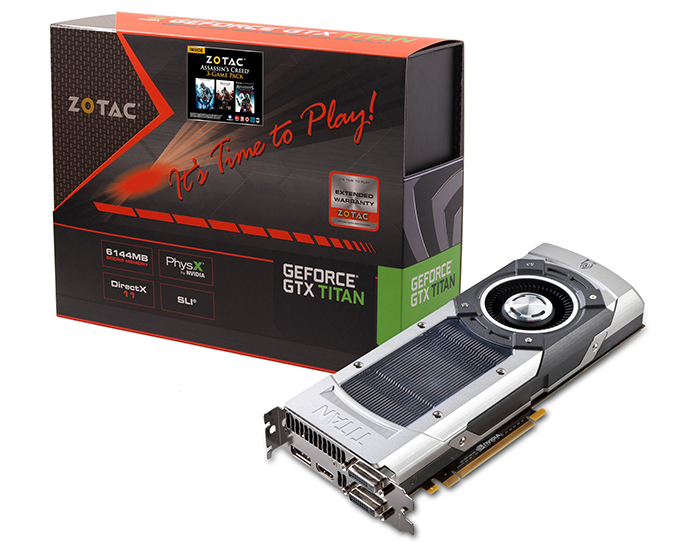 The prize is a Zotac GeForce GTX Titan graphics card (model ZT-70101-10P). Sweet! Forget all about other competitions, i want this! !